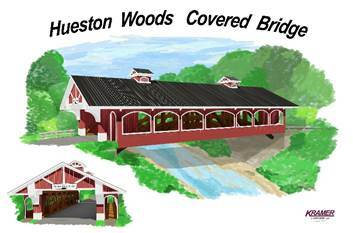 The Preble County Engineer’s Office has replaced the structurally deficient, functionally obsolete steel truss bridge over Four Mile Creek with a covered timber structure with walkways that meet FHWA requirements for load carrying capacity and geometrics. This improvement has been made to better suit the needs of the traveling public. The structure originally at this location was erected in the late 1920s and had numerous repairs to keep it in operation. The current structure is a covered timber structure with a span of 108 feet with a width from face to face of the guardrail of 28 feet. The new structure is also relocated approximately 40 feet to the north to improve the horizontal alignment of Camden-College Corner Road, and thus improve the safety features of this section of roadway. The current structure also includes walkways on either side of the structure to provide a safer area for pedestrian traffic and to provide a scenic viewing area. 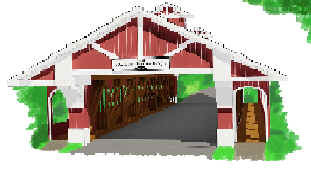 Coordinates for the covered bridge.